Oundle Town Under 14s are pictured before their 9-2 win over Blackstones. They are from the left, back, Daniel Morgan, Samuel Webster, Thomas Levick, Thomas Clarke-Knowles, Daniel Fuller, Callum Stott, Oakley Read, front, Harrison Scott, Josh Sanders, Charlie Sumner, Thomas Lee, Luke Yarland and George Weed. Glinton & Northborough Black caused the only upset when the Junior Alliance Under 13 League Cup competition resumed on Sunday. The Division Two side advanced to the last eight by beating Division One team Riverside 3-1 with goals by Kai Chilvers (2) and Harry Ward. Blackstones Under 14s are pictured before a 9-2 Peterborough Junior Alliance League defeat by Oundle Town. From the left they are, back, Cody Roe, Edward Mace, Brandon Follows, Jez Coupe, Jacob Sinfield, Alfie Buddle, Freddie Hibbitt, front, Sam Mostert, James Reid, Sam Wilson, Joseph Saunders, Ollie Jones and Archie Coupe. Division One big guns Yaxley and Park Farm Pumas Red both hit lower level opposition for six. 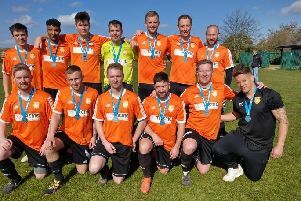 Unbeaten table-toppers Yaxley, the cup holders, were 6-1 winners against Northern Star while Park Farm Pumas Red knocked out Whittlesey Reds 6-0 with super sub Danir Abdulqadir slamming a hat-trick. In the Under 13 Hereward Cup there was a massive win for Bourne Town Claret. They bashed Blackstones 15-2 with no less than 10 of their players finding the back of the net. They were Oliver Henson (4), Louis Armstrong (2), Jack Bannister, Henry Benson, Tom Booth, Mathias Donaldson-Reid, Jack Golding, Jack Green, Oliver Roberts and Finley Thomas. Action from the game between Oundle Town U14s and Blackstones. Bourne Town Red also found goals easy to come by against Gunthorpe Harriers Navy. They won 6-1 with Rhys Crane and Sam Lister both firing doubles. Netherton United’s surge towards the Under 14 Division One title shows no sign of relenting. On Sunday they played third-placed Whittlesey Blue and ran out handsome 10-2 winners to make it nine wins out of nine. Hashim Mohammed Hussain, Habibullah Siafullah and Trafford Crane all bagged a brace with the other four goals coming from Drew Budd, Loui Catt, Wayne Cort and Bob Horne. Second-placed One Touch Football also won well, thrashing Hempsted United 10-0 with goals by Taylor Gilbert (3), Ben Griggs (2), Ewan Buckby, Rhys Holmes, Max Tompsett, Connor Ely and Ethan Young. Oundle Town beat Blackstones 9-2 to remain a point clear of Malborne Rangers in the Under 14 Division Three title race. Hot-shot Thomas Clarke-Knowles got four of their goals with Oakley Read (3) and Daniel Morgan (2) getting the rest. March Soccer School went four points clear at the top of Under 12 Division One with a 4-1 win over Hampton Royal. Two players ended up in hospital after suffering nasty injuries on Sunday. The Under 18 Division Three game between Werrington Athletic and Pinchbeck was abandoned after 52 minutes when Pinchbeck player Jack Brittain suffered a dislocated knee. Pinchbeck were leading 4-1 at the time. And in the big Under 16 Division One derby between Peterborough Northern Star and table-toppers Peterborough Sports, Sports player Calum Arden was taken to hospital with a leg injury which was later found to be a hairline fracture of the fibula. That game was completed and ended 2-2 with Ashton Bennett Williams and Alex Roe on target for Star and Nasir Nabi and Josh Dunmore scoring for Sports. Two teams with 100 per cent winning records in Under 16 Division Three clashed and it turned into a one-sided affair as 10-man Hampton crushed leaders Pinchbeck 9-1 despite falling behind after 80 seconds. Evan Walters struck a double hat-trick to reach 20 goals for the season, while Hampton ‘keeper Brandon Grypicz produced a brilliant penalty save. Ryan Barfoot also reached 20 goals for the season when netting a hat-trick for Under 15 Division One leaders Werrington Athletic Blue in their 3-2 win against Park Farm Pumas Blue. The previous week he scored all five goals in a 5-0 cup win against Thurlby Tigers.